Halloween-themed games are a fun way to get party guests into the spirit of the holiday and break the ice. There are plenty of games to play that are perfect for every age. From bingo and word searches to pumpkin tosses and guessing games, entertainment is easy to find this Halloween. Set up a pumpkin patch indoors or outdoors with real or plastic pumpkins. Hide toys, candy and money inside them. Let guests search for treasures and tally each person’s findings if you want to name a winner. Use crepe or toilet paper to wrap one guest as a mummy. Teams should decide if they want to play to create the most artistic, scariest or fastest mummy. When it’s time to unwrap them, make a game out of seeing who can pick up the trash the fastest. Just like Pin the Tail on the Donkey, your party guests will pin the face on a giant jack-o-lantern. Make this game out of construction paper or felt. Create funny and scary features to pin on a bare pumpkin. Before guests arrive, fill a jar with Halloween candies and make sure you count how many pieces you’ve placed inside. As guests enter your home, invite them to guess how many candies are in it. At a designated time, reveal the total and award a prize to the person who guessed the closest without going over. This game can be as fun or “icky” as you want to keep in line with the theme of your Halloween party. To play, place a variety of objects inside a box with a hole cut into the side or top. Have guests reach into the box and touch what’s inside. They’ll guess what they’re feeling and name up to five objects. After everyone has had a turn, reveal the contents and see who guessed the most items correctly. This party game is great for those who want to sit and relax while playing. Before your party, make your own Halloween-themed word search or download one from the internet. There doesn’t have to be a winner. Who doesn’t love bingo? There are plenty of Halloween bingo games online for guests to play, but you might like customizing boards with pictures and markers. Get creative. Use candies to mark spots and use Halloween words or pictures in the squares. Set a real or fake empty pumpkin on the floor inside your home or outside in the yard. Have party guests toss ping pong balls, bean bags, candy, coins or whatever you like into the pumpkin. Each partygoer gets five tosses. Set up a video screen or computer to run clips of scary movies for five seconds each. Let guests call out the name of the movie as soon as they recognize. You can play for prizes or fun. Start this Halloween game by sitting around a fire or in a circle. Have one guest start a story by saying a spooky sentence. The guest to their left will continue the story with another sentence, with each person taking a turn telling part of the Halloween tale. Set a time to end the lore or finish when everyone seems ready to move on. Another Halloween story game, this one is played like “Telephone.” One guest will whisper a very short story into the ear of the person sitting to their left. That person will then whisper it to the next guest, and so on. When the story gets back to the original partygoer, it will likely have taken on a life of its own. These are just some of the Halloween party games you can play to keep guests entertained and make your event memorable. You can even set up a Halloween craft table for kids. As Summer Ends, What's Next? As summer comes to an end and the leaves start changing, we look ahead to the crisp Fall air, picking apples, hiking and Fall Festivals. The 71st Warner Fall Foliage Festival will be held in Warner, NH October 5-7. Concerts, parades, food, amusement rides, woodsmen's contests are all a part of this rural life and vibrant festival. Visit www.wfff.org for details. Come visit the Gallery of Trees at The Inn at Pleasant Lake, 853 Pleasant Street in New London, NH. A beautiful display of trees will be decorated by local businesses and available to view from December 26 through January 1, 2018 from 1-7 p.m. You will have the opportunity to vote for your favorite tree and donate to the New Hampshire Food Bank. Hot chocolate will be served to keep you warm. For more information, go to www.innatpleasantlake.com or call 526-6271. Enjoy the Holidays! Springledge Farm will be having a "Seed Sowing Workshop, Part II" on April 29th from 10am-2pm. Another Workshop coming up on Saturday, May 6th will be "Pollinator Seed Sowing" from 11am-1pm. Springledge Farm is at 37 Main St. in New London, NH. Call 526-6253 or email to sign up. New for 2017! Spring Ledge Farm will be a pickup spot for fresh NH seacoast fish this season. They're partnering with NH Community Seafood who are offering a CSF (Community Supported Fishery) for the season. 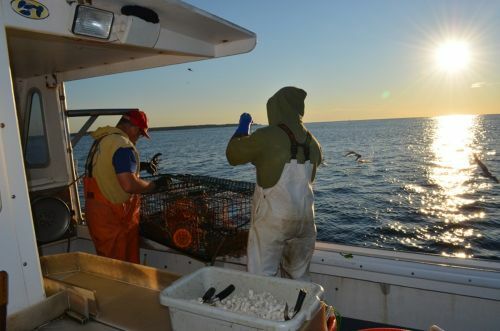 A great way to have fresh, local fish every week and support the seacoast fishermen in NH. Spring Ledge is the pickup spot only; in fact Spring Ledge does not make any money off the program. They are simply the pickup location for this area. All the monies go to the NH Community Seafood and the fishermen. The program details, payments, logistics and communication are all handled through NH Community Seafood. Any and all questions should be addressed to them. They have been working with farms as drop-off locations across the state for many years, and they have the experience and knowledge to answer all your questions. NH Community Seafood will send out emails each week with information on the catch of the week, including recipes and cooking tips. The shares can be 1/2 lb., 1lb. or 2 lbs. and includes shellfish and oysters (in season), but you can opt out of these. It is all very well explained on their website. Click here to read about why the program was started and how it benefits the local fishermen. Sign up is super easy, pickups will be on Saturdays. Check them out on Facebook @NHCommunitySeafood and their website nhcommunityseafood.com. Don't miss New Hampshire's Maple Sugar Weekend March 25 & 26. Visit local sugar houses and see how maple syrup is made and have a taste of maple candy. Visit http://www.nhmapleproducers.com/2016/11/04/2017-maple-weekend/ to find your closest sugar house and hours of operation. A good time for the whole family! Don't Miss Ice Harvest Day! Muster Field Farm Museum's ice harvest event will be held on Sunday, January 29, 2017 at 9am on Kezar Lake until the ice is in. Volunteers will demonstrate ice cutting by gas-powered saw and finished by hand. The ice harvest will be loaded by an ice block fulcrum onto wagons and vehicles then hauled to the farm. The ice house, c.1890, will be fully stacked with block ice for use at summer events. The Ryder Corner Schoolhouse, c.1810, will be warm and welcoming with hot beverages, homemade baked goods and hot soups. Antique cars converted into snowmobiles will be on display at the farm, free admission (donations appreciated), rain date 2/12/17. You can pull off a last-minute party with ease—when you keep the following in mind. There’s a special art to throwing a successful last-minute event. It requires a little planning and organization to make it happen with style and ease, but more importantly, throwing a last-second affair (without making yourself crazy!) largely comes down to your ability to let your normal entertaining-at-home etiquette slide. We’re not suggesting that you throw all party-planning ideas out the window; merely that you take a realistic approach to feeding hordes of unexpected guests. Your ability to roll with the punches and adapt to the circumstances will stand you in good stead when it comes to putting your home on the market, too. Unexpected knock from a potential home buyer? No problem! Here are some tips on pulling off a successful last-second soiree. If you have just a few hours (or minutes) before your guests are showing up, your goal is to be ready to welcome them when they arrive—not to be elbow-deep in a complicated recipe for homemade dinner rolls when the doorbell rings. Don’t try to do too much when you don’t have enough time; these kinds of gatherings are meant to be informal and relaxed, so make sure the food and the setting—and you—are, too. Know how quickly you like to work in the kitchen and plan the menu around what you can easily accomplish on short notice. Your guests will know (and appreciate) that you haven’t had much time to prepare. Don’t apologize for serving take-out food. It’s the company and atmosphere that are most important. Most guests would far prefer great company and mediocre food than the opposite—and many take-out options are unexpectedly delicious. If nothing else, you can rest assured that your kitchen won’t be filled with dirty pots and pans when your guests arrive. Leftover paper and plastic take-out containers are a cinch to whisk out of sight and straight into the garbage can! Choose foods that can be made ahead and reheated, or are easy to fix at the last minute. We’ve all thrown parties where we’ve spent the majority of the time in the kitchen, trying frantically to pull off some dish meant to impress our guests. This is not the party to try that trick. Stick to tried-and-true, easy recipes that don’t require much work to plate and serve. Foods that are designed to be served cold or at room temperature are good choices, as are those that you can make the night (or morning) before. If you can arrange them on a platter or serving dish before they go in the fridge, all the better. And don’t underestimate the value of keeping the ingredients for a quick dip or salsa on hand. Sometimes a quick Romesco dip—made with jarred roasted red peppers—can really save the day. Don’t be afraid to buy something from the bakery for dessert. No one will bat an eye if you pull out a cake or tart from the bakery for your party. Feel free to embellish it with fresh fruit, nuts, sprinkles or whipped cream if you like. Or, simply pass a plate of fresh fruit, nuts, and chocolates. Prep your table in advance. If possible, set the table the night before the party, and place beverages in the refrigerator to chill overnight. You can also take a buffet-style approach, and stack napkins and silverware in jars for guests to pick up as they go through the serving line. To Make Ahead: Hold (without glaze) at room temperature for up to 1 hour or refrigerate for up to 2 hours. Strawberries, Brie cheese, fresh basil and balsamic vinegar come together in this addictive one-bite appetizer recipe. Thread a strawberry, basil leaf and piece of cheese onto each of 12 toothpicks. Balsamic glaze is balsamic vinegar that’s cooked until it’s very thick. Look for it with other vinegars in well-stocked supermarkets. Or make it yourself by boiling 1 cup balsamic vinegar in a small saucepan over medium-high heat until syrupy and reduced to about 1/4 cup, 10 to 14 minutes. Per serving: 28 calories; 2 g fat (1 g sat, 1 g mono); 7 mg cholesterol; 1 g carbohydrate; 0 g added sugars; 1 g total sugars; 2 g protein; 0 g fiber; 45 mg sodium; 28 mg potassium. Want that Perfect Wreath on Your Door? Join in the fun at Spring Ledge on Saturday, December 3rd at 10am for a wreath-making workshop and bow-making tutorial. Learn how to craft a hand-made wreath using fresh balsam brush. Then make your own bow using ribbon offered at the farm. Cost is $18. and includes the instruction, wreath supplies & bow supplies. You'll finish with a beautiful wreath just the right size for your front door. Additional decorations will be available a la carte. Call 526-6253 to reserve your spot at Spring Ledge Farm, 37 Main St., New London, NH.